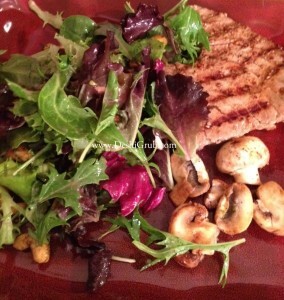 For this dish, I used 1 packet of (Trader Joes) Frozen Ahi Tuna Steaks but you can use fresh if you prefer. And of course, you don’t have to shop at Trader Joes if you don’t have access to one nearby. For the Ahi marinade: 2-3 tsp of olive oil, 2 heaped tsp of light soy sauce, 1 tsp of sesame seeds. 1. Defrost the steaks. Once defrosted wash and pat dry using kitchen towels. 2. In a bowl, prepare the marinade. Using the quanitities above, rub the marinade all over the ahi tuna steaks and marinate in the fridge (either in a bowl with a plate over it, or in an air-tight container) for a minimum of an hour. If you have time, longer is better although not entirely necessary for fish. 3. Once marinated and ready to be grilled, grill for 4 minutes on each side on medium heat. I use a skillet. (If the fish starts to stick to the skillet, spray with olive oil spray). 4. Prepare the mushrooms by heating 1 tsp of olive oil in a pan until hot. Add diced garlic and washed and sliced mushrooms. Fry for 3-4 minutes. 5. 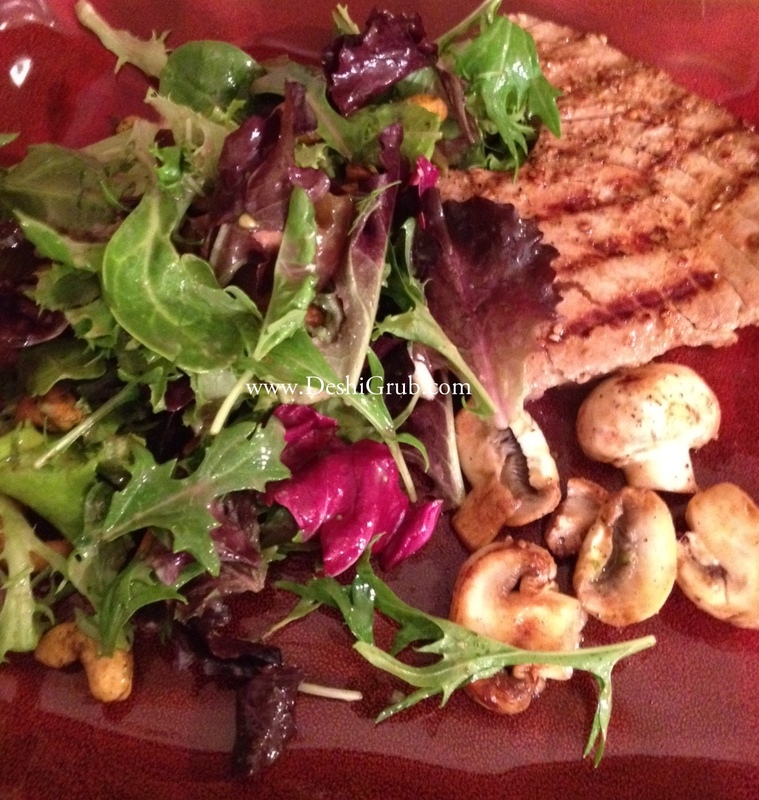 Greens can be served as is without a dressing since the fish and mushrooms are flavorful enough.